Loneliness and isolation in rural Wales is a "ticking time bomb" which must be tackled, a Welsh Government minister has said. 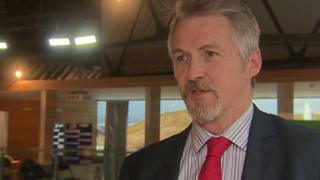 Huw Irranca-Davies, the social care minister, said that dealing with the problem was a national priority. According to the 2016-17 National Survey for Wales, around 17% of the population report being lonely. Mr Irranca-Davies made the comments ahead of a visit to the Royal Welsh Show in Llanelwedd. Nearly 20% of the Welsh population live in communities of fewer than 1,500 people. "Loneliness and isolation is a growing issue in communities right across Wales," Mr Irranca-Davies said. "It affects everyone - be it a young person or an older person, a farmer or a doctor, a single person or a married couple, and can potentially lead to a range of serious health and social care problems." The Welsh Government is drawing up a strategy to tackle the issue. Lesley Griffiths, Cabinet Secretary for Energy, Planning and Rural affairs, added: "The farming lifestyle of working long hours every day of every week, very often alone, means any opportunity for interaction with others is often greatly reduced." "There is a wide range of support available to farmers and rural communities and I urge anyone suffering to not suffer alone and access the help available," she added.